Built in 1915. Operated by Landmark since 1989. On Friday, December 3, 1915, the Downer Theatre opened its doors to the public. It was one of the finest and most modernly equipped motion picture houses in a residential district in the country, making it the prototype for "neighborhood" theatres at the time. It cost nearly $65,000 to build and boasted a seating capacity of 1,200. Music being an important accessory to the motion picture back then, the Downer had not only a Weickhardt pipe organ, but an orchestra as well. In May 1990, the Downer re-opened its doors to the public after a much-needed facelift. Transformed into a twin-screener, the new Downer was bright and classic, with the auditoriums painted a cream color. The decorative molding was brought back to life with gold leafing and gaslight-type lanterns lined both auditoriums. New carpeting that resembled the original carpeting from 1915 now covers the Downer lobby and theatre floors as well as the partitions on the walls of the auditoriums. 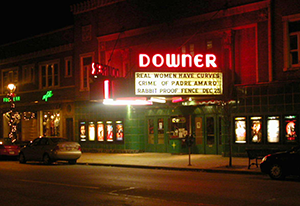 Located on friendly Downer Avenue in Milwaukee's upper Eastside, the charming Downer Theatre is the oldest operating movie theatre in Milwaukee and features the finest in independent film and foreign language cinema.